Rod Smith, running back for the Dallas Cowboys, waves to the crowd during the McAllen Holiday Parade at McAllen Veterans Memorial Stadium on Saturday, Dec. 1, 2018, in McAllen. 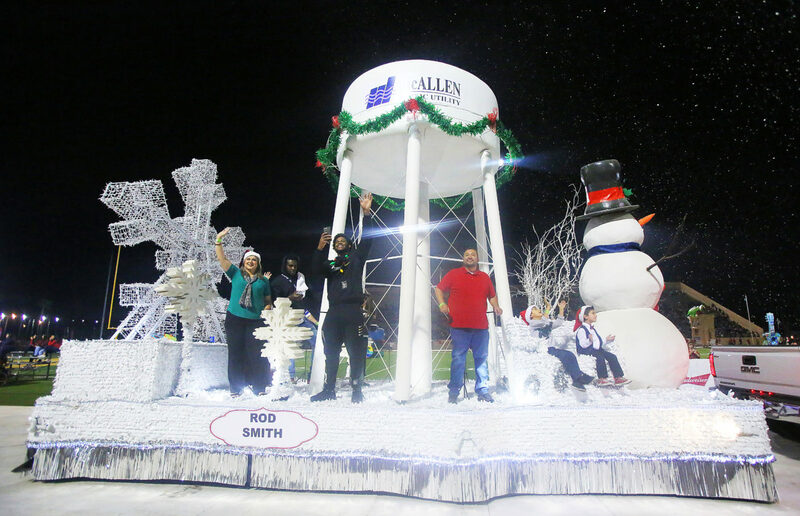 McALLEN — The fifth annual holiday parade brought the city just over $90,000, giving McAllen consecutive years of positive parade-related revenues, a university analysis found. December’s parade featured players from the Dallas Cowboys, telenovela celebrities and marching bands from across the United States and Mexico, and city officials now feel that the parade is a signature event. “It’s gone from startup — new — to the best parade in the world,” Joe Vera, the assistant city manager who oversees the parade, said at a city workshop on Monday where University of Texas Rio Grande Valley representatives presented their analysis. Vera cited several awards to back up his best-in-show claim. The study found that more than 250,000 people attended the December parade, and that most of the more than 500 people surveyed for the study attended the event to see the Dallas Cowboys players. The study also found that 13 percent of attendees stayed at least one night in McAllen, a crucial injection for the local economy, officials noted. The UTRGV analysis also said $13.4 million was injected into the regional economy. “They’re staying at the hotels, they’re spending the money here in McAllen,” said Michael Uhrbrock, economic research director for UTRGV. Uhrbrock has also presented these annual parade studies to commissioners in previous years. Another component Uhrbrock pointed out was that the parade attracted a more diverse crowd. In 2014, the inaugural year, 97 percent of parade attendees were from the Rio Grande Valley. This year, that number dropped slightly to 94 percent, with 1.6 percent coming from Mexico, and the rest from elsewhere. Also from Mexico were multiple marching bands. The city has now drawn Cowboys players in consecutive years, which has drawn a few questions from citizens asking why Houston Astros players were not on hand after they won the World Series in 2017, or, generally, why other athletes have not been part of the parade.